Two local businesses have slung their weight behind the Park Centre Belfast Celtic Museum by funding new storyboard displays - and they are businesses with Celtic connections. Failte Restaurant and The Rock Bar paid for the production of new storyboards, which go on display ahead of a major Belfast Celtic Society event on Sunday, June 30th celebrating the life of Belfast Celtic’s greatest player, Mickey Hamill. Former Celtic star Niall McGinn, who part-owns Failte Restaurant, dropped into the Celtic museum to personally hand over the storyboards and see the 250 exhibits on display, along with his agent Gerry Carlile, who also part owns the Rock Bar. Both were very impressed by the museum and took a short tour with a guide from the Belfast Celtic Society. 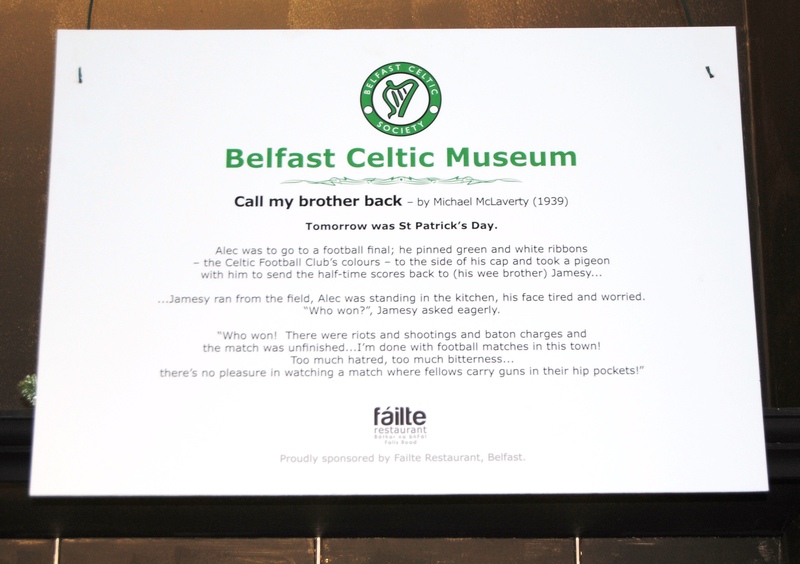 Speaking afterwards, Gerry Carlile said; “I couldn’t help but feel a sense of loss when vising the Belfast Celtic Museum – it’s such a fantastic story. “It’s great that the museum is on the site of the old Celtic Park to ensure that the story will never be forgotten. There’s history between Belfast Celtic and the Rock Bar – one of the most famous patrons was St James’s Celt Paddy Bonnar and his picture still sits behind the bar." 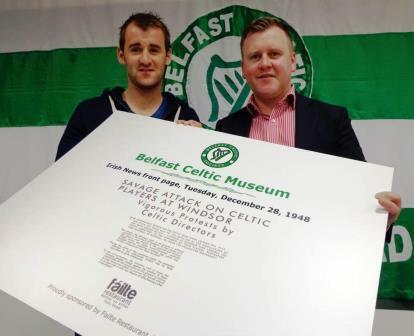 Former Glasgow Celt Niall McGinn and local football agent Gerry Carlile hand over one of the new Belfast Celtic storyboards, now on display at the Belfast Celtic Museum in the Park Centre. The boards were produced ahead of a major event on June 30, marking the 70th anniversary of Belfast Celt Mickey Hamill, regarded by many as Ireland’s greatest footballer. A plaque unveiling at Hannahstown Cemetery will take place at 12 noon, followed by a visit to the Belfast Celtic Museum in the Park Centre where a new Hamill Exhibit will be revealed. There’s even a storyboard explaining how Belfast Celt Jimmy McAlinden, who hailed from Lady Street, was responsible for the stellar career of former Celtic manager Martin O’Neill, crediting him as “the man who taught him the game” while manager of west Belfast club Distillery. Belfast Celtic Society Chairman Padraig Coyle, thanked the Rock Bar and Failte for their support, saying; “Without this type of help, our Society couldn’t operate. We’d like to pass sincere thanks to Gerry and Niall for their help in the production of the storyboards – but also for their interest in the Belfast Celtic story and their encouragement for our Society. The storyboards provide a brilliant contextual backdrop to the museum’s pictures and exhibits and prove how the club has entered the pantheon of Irish history. It’s very timely for these new storyboards to go on display, as we prepare to celebrate the life of Mickey Hamill on Sunday, June 30 with a graveside event at Hannahstown at 12 noon, then our museum will be open afterwards so everyone can have a look. Glasgow Celtic Director Brian Wilson will travel to Belfast to represent the club at Hannahstown graveyard on June 30 and the gathering is a joint event between the Belfast Celtic Society and the Scottish based Celtic Graves Society.